AMES, Iowa — The Iowa State University College of Agriculture and Life Sciences and the Iowa State University Alumni Association presented awards at the annual Honors and Awards Ceremony on Oct. 28. Cindie Luhman received the Floyd Andre Award. This award honors an alumnus who has made outstanding contributions to production agriculture, agricultural business or who has had a significant impact on Iowa agriculture. Luhman, of Webster Groves, Missouri, received her bachelor’s degree in animal science in 1983 and doctorate in nutritional physiology in 1990. An award winning scientist, she is an expert in animal nutrition and serves as group vice president, research and development for feed and dairy foods for Land O’ Lakes, Inc. and Purina Animal Nutrition. Her expertise has led to 11 U.S. patents surrounding technologies for dairy cow nutrition. Under her leadership, Luhman’s research teams develop technologies that drive nutritional innovation for beef, swine, equine, dairy and companion animals as well as product innovation in dairy foods. Luhman is a member of the American Society of Animal Science and the American Dairy Science Association (ADSA). From 2011-2015, she served ADSA as chair of the foundation. An avid animal advocate, she also serves as vice president for Senior Dogs 4 Seniors Animal Rescue and fosters dogs for the organization. Walter Hill received the college’s George Washington Carver Distinguished Service Award. The award honors college alumni and friends who have demonstrated outstanding achievement or leadership in making significant, influential or innovative contributions to society. Hill, of Tuskegee, Alabama, serves as vice provost of Land Grant University Affairs and dean of the College of Agriculture, Environmental and Nutrition Sciences at Tuskegee University, as well as director of the George Washington Carver Agricultural Experiment Station and 1890 Research and Extension Programs. He is a champion for student development, diversity and inclusivity. 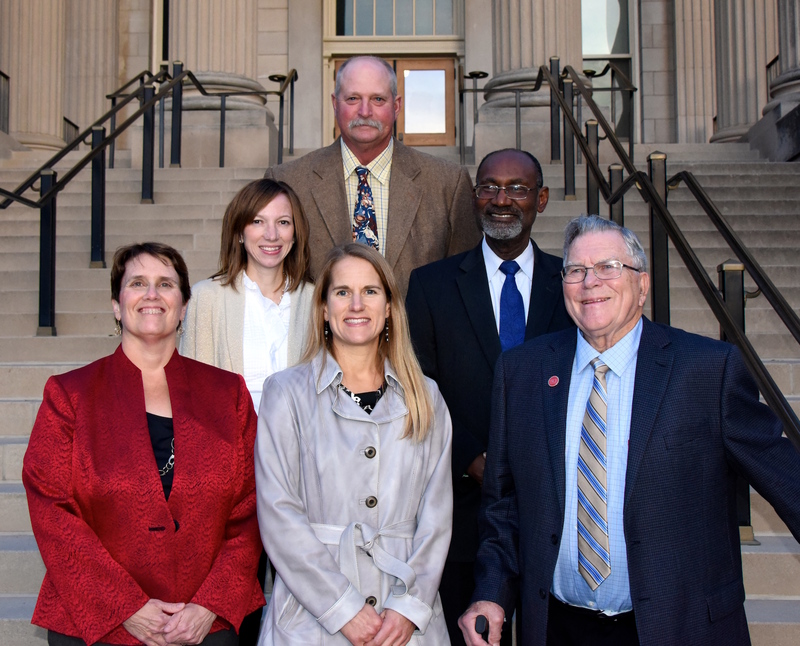 Hill’s leadership and vision led the development of a recent agreement between Tuskegee and Iowa State to strengthen collaborations in research, education and extension and outreach. It has resulted in a cooperative study of foods made from purple hull peas and participation of Tuskegee undergraduate students in the college’s George Washington Carver Internship Program. His service includes leadership for organizations such as the Association of Public and Land Grant Universities, STEMconnector Ag and Food Council, USDA 1890 Task Force Executive Team, Alabama Agricultural Land Grant Alliance and the Ag Diversity and Inclusion Round Table. He is founder of the Carver Integrative Sustainability Center and project director of the Sustainable Agriculture Consortium for Historically Disadvantaged Farmers. Robert E. Walton, Sr. was honored with the Henry A. Wallace award. The award honors a college alumnus who has achieved notable professional achievements nationally or internationally and brought distinction to themselves, the college and the university through significant contributions. Walton, of DeForest, Wisconsin, is recognized as one of the top agribusiness leaders in the nation and globally renowned for his contributions in genetics research for the dairy, beef and plant breeding industries. After receiving his doctorate in animal science in 1961, Walton joined the team at ABS as a geneticist. He served the company, later purchased by W.R. Grace, as president beginning in 1967. During his tenure, ABS expanded its business across the globe. In 1987 he also became chairman of Agracetus, the plant breeding research arm of W.R. Grace, until his retirement in 1992. Walton has served a number of organizations in the animal agriculture industry, including the National Association of Animal Breeders, Wisconsin Cattlemen’s Association, Wisconsin 4-H Foundation, Wisconsin Rural Opportunity Foundation and the Greater Madison Chamber of Commerce. Most notably, Walton served 38 years on the board of the World Dairy Expo and holds the honor of the longest serving director. Nancy Bohl Bormann received the Outstanding Young Professional Award honoring an early to mid-career college alumnus who has distinguished themselves through significant advancement and achievement in their discipline, field or area of expertise. Bohl Bormann, of Bode, Iowa, farms with her family in North Central Iowa and serves as environmental services manager and agronomist for Maschhoff Environmental, Inc. She received her bachelor’s degrees in environmental science and agricultural and life sciences education in 2004. She implements conservation practices on her farming operation and works with producers to use nutrients in a way that is beneficial to Iowa agriculture while protecting land and water. Bohl Bormann earned her master’s degree in soil science from the University of Wisconsin-Madison and is a certified crop advisor. She serves as commissioner for the Kossuth Soil and Water Conservation District and Region 2 second alternate director for the Conservation Districts of Iowa. She is a member of the Algona FFA Alumni Organization and serves on the Algona High School Agricultural Advisory Council. Bohl Bormann participates in the college’s young alumni initiative, Curtiss League, and sits on the Iowa State University Honors Alumni Board. Richard and Nancy Degner were recognized with the Iowa State University Alumni Association’s Alumni Medal Award. This premier award has been presented to alumni who demonstrate loyal service to the university through alumni-related activities. Richard, retired CEO of the Iowa Pork Producers Association and Nancy, retired executive director for the Iowa Beef Industry Council, have spent their lives and careers advancing animal agriculture, bettering their community, and supporting Iowa State. Richard received his agricultural and life sciences education bachelor’s in 1972 and master’s in 1977. Nancy received her bachelor’s in food science in 1972. The Degners, of Ankeny, Iowa, are members of Gamma Sigma Delta, the honor society for agriculture, and received the organization’s Alumni Award of Merit in 2006. In 2008, the couple received the college’s George Washington Carver Distinguished Service Award. Both have been active members of the college’s Dean’s Advisory Council and have been inducted into the Iowa State Department of Animal Science Hall of Fame. Nancy is a member of the Iowa Cattlemen’s Association Hall of Fame, has received the Impact Award from the Iowa State Department of Food Science and Human Nutrition and the GEM Award from the Iowa Dietetics Association. Richard received the U.S. Meat Export Federation’s Distinguished Service Award in 2015 and is a past member of the ISU Alumni Association Board of Directors. He also is a longtime board member for both the U.S. Pork Center of Excellence and the Coalition to Support Iowa’s Farmers. Rachel Allbaugh received the Iowa State University Alumni Association’s Outstanding Young Alumni Award. This honor recognizes alumni age 40 and under, who have excelled in their professions and provided service to their communities. Allbaugh, of Boone, Iowa, received her bachelor’s in animal science in 2000 and doctorate in veterinary medicine in 2004. She serves as an assistant professor in the Iowa State College of Veterinary Medicine’s department of veterinary clinical sciences, specializing in ophthalmology. Allbaugh is one of only 445 ophthalmology boarded veterinarians in North America, and one of just 70 in academic positions. In 2015 she was honored as the College of Veterinary Medicine’s Faculty Member of the Year and her ophthalmology team was recognized as the Service Team of the Year. She has been a diplomate of the American College of Veterinary Ophthalmologists (ACVO) since 2008, and currently chairs the credentials committee. Allbaugh also is active with the International Equine Ophthalmology Consortium. She served as chair of the program committee for multiple years and was recently elected to the board of directors. The Jeff and Deb Hansen Agriculture Student Learning Center (HASLC) received the Iowa State University Alumni Association's Impact Award. The award recognizes individuals, businesses, organizations or units whose programs or accomplishments brought broad recognition to the university and increased the involvement of Iowa State constituents in the life of the university. The facility is a 66,555 square-foot facility that hosts events and classes on the universiy, community, state and national levels. It creates opportunity for a hands-on learning environment for Iowa State students, and is completely studen-run. In 2015, the center attracted more than 35,245 visitors for classes and events, and is the first facility to be honored with the Impact Award. Marshall Ruble, manager of the center, accepted the award on behalf of the facility. Ruble received his bachelor's degree in animal science in 1978. The Iowa State College of Agriculture and Life Sciences (CALS) and the Iowa State Alumni Association presented awards at the annual Honors and Awards Ceremony on Oct. 28. Pictured from left, back row: Marshal Ruble; middle row: Nancy Bohl Bormann and Walter Hill; front row: Cindie Luhman, Rachel Allbaugh and Robert Walton.